New to the fall safety equipment industry are Class A retractable lifelines. Class A retracts meet the newest ANSI Z359.14 standards, meaning these retracts are top-of-the-line and will keep you and your construction site ahead of the curve when it comes to safety protocol. You might be wondering what changes came about with ANSI Z359.14. These new standards have increased the test weight for dynamic performance and require that all retractable lifelines be classified as either Class A or Class B based on their performance tests. More specifically, the weight requirement for testing has increased from 220lbs to 282lbs, +/- 2lbs. To be classified as Class A, the arrest distance can’t exceed 24” and the force can’t exceed 1,350lbs with a max peak of 1,800lbs. When environmental conditions (hot, cold or wet) are taken into account, the force can’t exceed 1,575lbs with an identical peak of 1,800lbs. Fall Safe USA is currently the only manufacturer that develops Class A web retracts at 11’ in length and shorter. Pictured to the right is their 7’ variety with an aluminum housing and 1” Dynema webbing. The snap hook features a double locking swivel with a 3,600lbs gate rating and a steel carabiner. All Class A retracts from Fall Safe USA feature a hook rating of 5,000lbs and a max working load of 310lbs. They also meet the OSHA 1926-502 standard as well as ANSI Z359.14-2012 and A10.32 2004 standards. Available in single and double web retracts, these Class A retractable lifelines from Fall Safe USA are a smart choice for any construction team that wants an upgrade to their fall arrest devices. The double retract is a new and innovative approach to fall protection equipment. By utilizing two lanyards instead of the traditional one, a double retract more evenly distributes the weight of the wearer, reduces fall distance and stress on the retractable lifeline and removes any tripping hazard. One of their most prominent features, however, is the ability to secure you from two separate beams, rails, or anchor points. This keeps you centered between two points at all times and prevents dangerous dangling and swinging in the event of a fall. Double retracts are ergonomically designed to provide a quick, easy and strong connection to your safety harness while staying out of your way while on the job. With full swivel connections, your range of motion is never impeded and they can connect to vertical or horizontal anchor points easily. They are designed with various connections from carabiners to rebar hooks and come with cables or sturdy webbing depending on your needs and preferences. 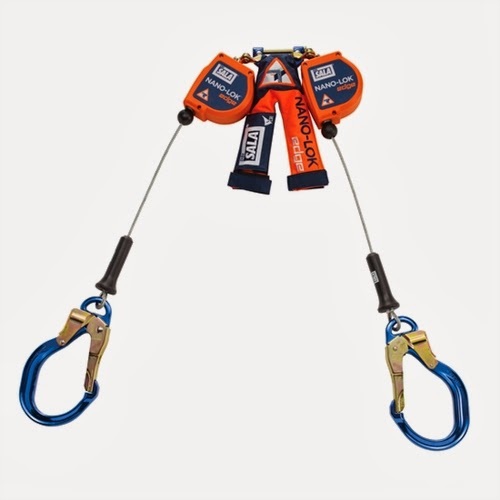 They are used as 100% tie-offs, making them versatile for a variety of tasks and heights allowing you to leap frog from one anchor point to the next without worry for your safety. Another feature that makes double retracts so innovative and popular is they eliminate the need to use traditional, two-legged lanyards. This gives the wearer more mobility and comfort, and keeps the retract out from under the feet where it could cause tangling, snags, or trips. 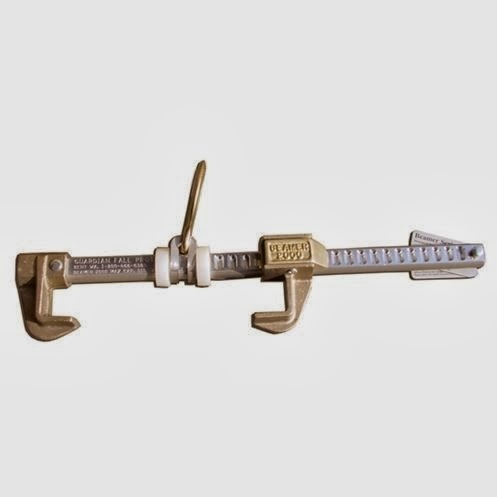 The Nano-Lok pictured at right is specially designed for foot level tie-offs to reduce fall length, double retracts feature a shorter cabling length, usually 6 to 8 feet. This makes them perfect for high and tight spots where space is at a premium and you need to avoid clutter. Remember to always reattach a disengaged hook to an anchor point before detaching your active SRL! Give double cable retracts some consideration when you’re buying new fall protection equipment for your construction team. The peace of mind makes all the difference. Guardian has long been known as a reputable brand for fall arrest systems, and their Beamer 2000 takes the cake when it comes to sliding beam anchors. This machined aluminum bar is cut with the utmost precision and is lightweight and easy to use. Slide it up and down steel beams with ease, and keep it firmly in place using its adjustable D-ring. While this sliding beam anchor may be lightweight, don’t let that fool you into thinking it can’t run with the big boys. This Cadillac of sliding beam anchors can handle up to 5,000 lbs. of weight, so you know you’re in good hands the first time you install it at your job site. Extremely lightweight, weighing in at just 4 lbs. Offered at an unbeatable, discounted Harness Land price of no more than $140, this puppy is a steal. It even goes on further discount from time to time, so check out the Guardian Beamer 2000 and see how it can help improve safety and productivity at your job site!